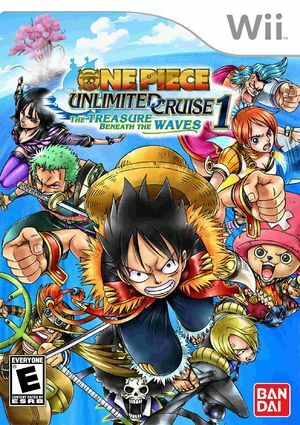 One Piece Unlimited Cruise 1: The Treasure Beneath the Waves is a video game for the Nintendo Wii based on the manga/anime series One Piece. Episode 1 was released in Japan on September 11, 2008, with the second and last episode released February 26, 2009. Episodes 1 and 2 have also been released in Europe on June 19, 2009 and September 25, 2009 respectively. Fishing without Wii Remote controllers is difficult. It requires holding A to "Swing" the nunchuk then releasing A to cast. One workaround is to establish Shake X and Y buttons. While holding A for fishing hold the shake buttons and release A, which should enable fishing. Left and Right Tilts should also be configured to allow rod control. The graph below charts the compatibility with One Piece Unlimited Cruise 1: The Treasure Beneath the Waves since Dolphin's 2.0 release, listing revisions only where a compatibility change occurred. This page was last edited on 16 January 2018, at 08:14.